Not all Kickstarter campaigns reach their goal, but that doesn’t mean it’s game over for a great idea. 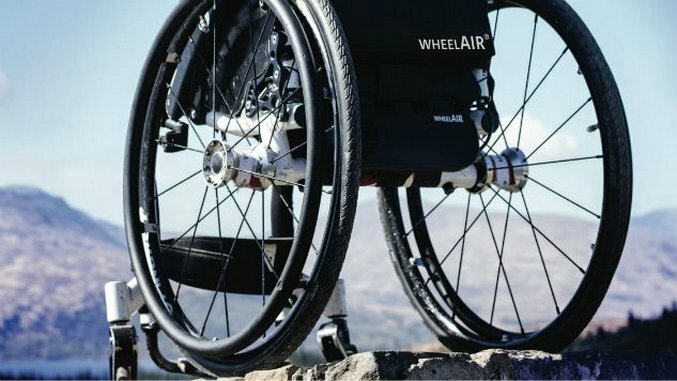 One recent project, the WheelAir, has still gone onto success despite struggling to meet its Kickstarter target. The WheelAir is a cushion that solves a problem not many able bodied people have considered. It’s a backrest cushion that cools all manual wheelchairs, while remaining ergonomically designed to provide more support. Its fan technology gently blows cool air onto the user’s back, enhancing their comfort and taking away any excess heat and moisture. The idea came from Corien Staels’s experiences while studying at university. Those with spinal cord injuries are particularly affected by this issue because their body can no longer communicate with their brain to say it’s overheating and needs to start sweating. With a high risk of heatstroke and hyperthermia, staying cool is a vital part of living with such an injury. Determining there must be a better solution out there, Staels got to work on improving wheelchair users’ lives. Being fortunate enough to research the problem and possible solutions as part of our undergraduate dissertation, she decided to start a business around WheelAir while studying for her Masters at the University of Glasgow. “I knew I had to make this solution available to all the wheelchair users who could benefit from WheelAir,” she says. Since incorporating at the start of 2016, Staels Design has been going from strength to strength, winning multiple business competitions, while finalizing its product development. WheelAir is the company’s first product but Staels is adamant that it’s far from the last. The company launched its Kickstarter campaign in June 2017, but struggled to reach its goal by its conclusion on July 1. While only raising £10,000 of its £30,000 goal, WheelAir fortunately hasn’t floundered. That’s thanks to the firm winning £100,000 at the Scottish EDGE business awards, a competition that saw £1.3 million handed out in grants and loans to start-up businesses across Scotland. Staels Design is determined to provide WheelAirs to its earliest Kickstarter adopters, while also working on producing more WheelAirs for potential customers. To counteract this, the firm has published several blog posts written by wheelchair users who experience overheating on a daily basis. The Kickstarter campaign page has also been extensively helpful, explaining the benefits as well as the technical features involved with WheelAir. Velcro makes it easy to attach and detach the cushion, while an easy click system attaches and detaches the fan box. It offers four cooling levels with a battery life of up to 20 hours. While the Kickstarter campaign wasn’t successful financially, it’s provided a lot of publicity for WheelAir. That’s been hugely advantageous. Staels Designs has many other products in mind, but is remaining focused on the WheelAir for now. It also plans to make the cushion available for power chairs in the future, ensuring all wheelchair users can enjoy a cooler experience. For current early adopters of the WheelAir, the plan is to send out cushions no later than November with more to come for new customers later on.